Today’s recipe is goguma-mallaengi, which are steamed and dried sweet potato slices served as a snack. I think this is the simplest recipe I have ever posted! It’s easy to make, chewy, filling and full of sweet potato flavor. I used to visit my grandmother’s house in the wintertime when I was young and she would make this all the time. She lived in a traditional Korean house with a heated floor, and while she slept on the warmest spot, she partitioned off the coldest spot with a wooden divider and kept her sweet potato there all winter, as well as her Korean radish. It was always there, living with us humans! On some long winter nights we’d take out a sweet potato, slice it, and eat it raw like a snack. It had a chestnut texture. But the main purpose of her sweet potato was to eat them for lunch, steamed and served with kimchi. Rice was scarce in those days, so steamed sweet potato was a good substitute. Another thing she made with sweet potato was ppettegi (뻬떼기), which was sweet potato sliced after harvest and then sun dried into a hard rock. We ate them straight as a snack, but I remember the taste was not that great compared to real candy. For lunch she would put some ppettegi in a big pot with water and boil it until the sweet potato slices turned soft. It’s called ppettegi-juk (빼떼기죽: ppettegi porridge). She added some sweetener while it was boiling. Sugar was also scarce in those days and a real luxury, so she used straight saccharine to sweeten it. Some people would be shocked if you did that now, but in those days that it was our usual, simple lunch. Maybe someday I’ll share the recipe with you. Everyone knows sweet potato has a lot of vitamins and fiber, and some people claim they are anti-cancer, so I decided to make this recipe and share it with you. This goguma-mallaengi is good between meals, especially if you are outside the house and are hungry it can be an emergency snack. Always carry some with you and even one piece will stave off your hunger! Wash sweet potatoes in cold running water and put them into a steamer basket. Bring 2 inches of water to a boil in a steamer over medium high heat. Add the sweet potatoes to the steamer, and cover and steam for 30 minutes to 1 hour. The cooking time depends on the size of the sweet potatoes, so after 30 minutes, open the lid and poke the most plump sweet potato with a wooden skewer or a stainless steel chopstick. If it goes through smooth, it’s well cooked. If not, cook longer. Remove from the heat and let cool for 5 to 10 minutes. Transfer them to large cutting board. Remove the skin and slice them into ⅓ inch (about 1 cm) thick. Put all the slices into a dehydrator. Set the temperature to 145ºF and turn on the dehydrator. About 6 hours later, turn off and turn the sweet potato slices over by hand. Turn on the dehydrator and dry for another 6 hours. 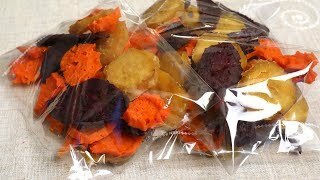 Put the dried sweet potato slices into a plastic bag and serve as a snack. They will be good for up to 1 week at room temperature or 1 month in the freezer. Posted on Saturday, January 13th, 2018 at 5:47 pm. Posted March 29th, 2018 at 12:12 pm | Log in to reply. I will spend a lot of time with your recipes as they are excellent. Posted April 3rd, 2018 at 8:41 am | Log in to reply. Posted March 4th, 2018 at 12:09 am | Log in to reply. Hi Maangchi! Thanks for this recipe. Where did you buy your steamer insert? Posted March 6th, 2018 at 2:28 pm | Log in to reply. When I bought my pressure cooker, they came together. This recipe was originally posted on January 13, 2018 at 5:47 pm by Maangchi. The video was watched 228,382 times on YouTube & has 8,494 likes!